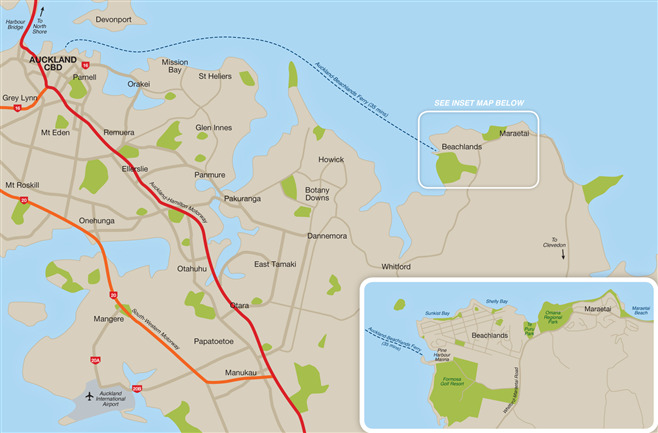 Beachlands and Maraetai are twin settlements located just 17 minutes from Botany, 19 minutes from Manukau and 35 minutes from the Airport and Auckland City. We are also only moments from the Formosa Country Club which consists of a world class Bob Charles designed golf course, restaurant, deluxe accommodation and convention centre. Perform Fitness is located at Formosa on the way in to Formosa and is complete with tennis court, squash court and swimming pool. Adjacent to the Formosa County Club is Pine Harbour Marina complete with marina berths, public boat ramp, boat builders, electrical and marine engineers, cafés, restaurants, chandlery shop and various other facilities. Pine Harbour Marina also operates a very popular week day ferry service to Downtown Auckland and once a week weekend run to Waiheke. The ferry is of huge benefit for our city commuters who wish to avoid the motorway’s peak hour traffic, parking hassles and want to arrive fresh and unstressed. Both Beachlands and Maraetai have a Primary/Intermediate School that caters from new entrants (Year 1) through to form 2 (Year 8). Beachlands School roll presently stands at approximately 550 while Maraetai Beach School has approximately 300 students. If your children are College age there is a free school bus that will take them to colleges in Howick or onto Strathallan College in Karaka. Pre-school children are well catered for with a Kindergarten in Maraetai, Play Centre and Daycare Centres in Beachlands. Beachlands may only be a small seaside suburb, but one thing we do have apart from our gorgeous beaches is a very dedicated shopping centre. This consists of a supermarket, a superette/dairy, liquor store, bakery, 3 take-away shops, Video Ezy, Post and Lotto shop, Kiwi Bank, hairdresser’s, physiotherapist, an Indian restaurant as well as a Thai restaurant, a pharmacy and a butcher, as well as a new Energy Experience Centre which caters for outdoor adventures and health options enhancing people's nutrition, fitness and injury recovery routines together with a health consultancy and retail centre. Most of these outlets are open six to seven days a week. Just down the road we have a Hammer hardware store and Phil's motor vehicle mechanic centre. There is also a Medical Centre, a Police Station and Library as well as a WOWFIT personal training centre. Most of the day to day needs of our community are well catered for. Maraetai, Whitford and Clevedon also have small shopping centres with specialty shops, and Maraetai has a number of well patronized waterfront cafes as well as Envision personal training centre. In December, 2013 a Santa Parade was organised by the Beachlands Community Trust and Sunkist Bay Reserve was full with craft and food stalls for family to enjoy followed by an evening concert in an ideal setting. We have many clubs in the area, and they are always on the lookout for new members - no matter what age you are - young or old there is something for everyone. You can take your pick from sailing, rugby, touch rugby, soccer, tennis, athletics, gymnastics, netball, aerobics, indoor and outdoor bowling, scouts, girl guides, cubs, arts and crafts, Probus, garden circle, St John’s, Civil Defence, Senior Citizens Club, Toastmasters or Rifle Club. The Te Puru Community Sports Facility on the edge of Omana Reserve is a magnificent sports and community complex set on 17 hectares of sporting grounds, boasts tennis courts, gym, international standard indoor netball court, badminton courts, conference and function rooms, and bar facilities. Wednesday night it hosts a popular touch tournament in the summer and an extensive list of activities for the kids extends throughout the summer holiday. If equestrian is what you are into then there are Pony Clubs at Beachlands and Whitford and Polo grounds at nearby Clevedon. 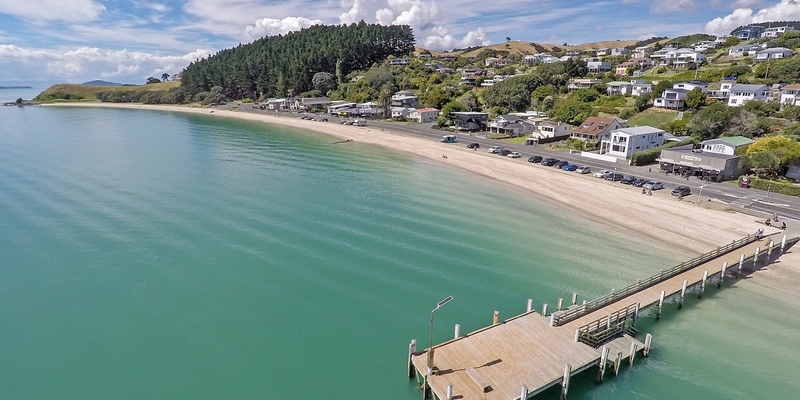 In our opinion, Beachlands and Maraetai have more to offer than many towns twice their size but best of all, they still have community interests at their heart and is a breath of fresh air next to the sea.